A federal judge has ruled in favor of President Trump in his effort to appoint the acting head of nation’s top financial watchdog agency, the Consumer Financial Protection Bureau. In a ruling from the bench Tuesday afternoon, Judge Timothy Kelly declined to stop on an emergency basis the president from putting in place Mick Mulvaney, currently the White House’s budget director. In doing so, Kelly ruled against Leandra English, the CFPB’s deputy director. English had requested an emergency restraining order to stop Mulvaney from becoming the acting director of the bureau. The leadership of the bureau had been thrown into chaos over the weekend after its permanent director, Richard Cordray, resigned and appointed English as his successor. Both Mulvaney and English claimed to be the rightful acting director. 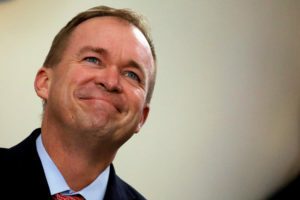 Left: A judge ruled in favor of President Donald Trump on Tuesday, allowing his appointment of White House budget director Mick Mulvaney, seen above, to the head of the Consumer Financial Protection Bureau to go through. File photo by REUTERS/Carlos Barria/File Photo.